Mike: I had come face to face with the building married to the impression formed in my youth, the scene of escape hours before Saigon fell to the communists. It was time to head back to the Tân Sơn Nhất airport to board Vietnam Air for a half-hour flight to Phnom Penh, Cambodia’s capital. Linda: We picked our accommodations on Airbnb. Our hosts had a spacious, modern high-rise only a block from the lively riverfront of the Tonle Sap. Less congested than Chicago’s Magnificent Mile, the shopping, night life, and tourist district touts open-front restaurants where traditional Khmer and Thai herbs and spices arouse the senses: jungle cardamom, lemongrass, and kaffir lime; basil and lotus stem. Their “Asian spring onion” looks similar to flower chives but doesn’t smell like an onion—it smells like dinner! On podiums along the sidewalk the menus tempted us. I wanted to stop in every café. Imagine Galveston’s Seawall Boulevard, except on each block the buildings are densely packed together. Across the busy four-lane road people jog and workout on public exercise equipment installed on the spacious pavement of Riverfront Park. Everywhere, tuk tuks (motorcycle-carriage vehicles) are for hire. One can barely walk three yards without an entrepreneur offering a ride in his tuk tuk. Phnom Penh, translated as “Penh’s Hill,” was named for a widow who had a temple built there. Borrowed from Sanskrit, the word for temple is wat. In 1372, Lady Penh found a Koki tree floating down the Tonle Sap after a storm. Inside the tree were four bronze Buddha statues. She believed this was a divine blessing, and asked villagers to help her build a wat out of the Koki wood to house the statues. Wat Phnom still stands and is open to visitors. Inside are many more Buddha statues, much burning incense, and a place for worshippers to pray. We removed our shoes, as required, and entered to witness the sacred practice of their faith. Cambodia’s modern wats, lavish and intricately carved, are many, but these are not the only buildings that capture attention. Over the years, Phnom Penh has become known for its architecture. In the 1920s, the “Pearl of Asia” was one of the loveliest French-built cities in Indochina, strong in tourism and trade. French colonial buildings can still be found along grand boulevards. Our stay was next to the Royal Palace and near the National Museum, both architecturally and historically significant. This is the Angkor region of the Kingdom of Cambodia. From the ninth to the fifteenth centuries, Angkor was the seat of the Khmer Empire, the largest empire of Southeast Asia. Over 4,000 ruins, surviving ancient wats, including mammoth Angkor Wat, remain as evidence of the world’s largest pre-industrial urban center—greater than New York today. The most important part of visiting this city was yet to come. Join us next week for a chat about survival and restoration after genocide. Mike: Captured in an iconic snapshot is a “Huey” helicopter landing on a roof in downtown Saigon. UPI photographer, Hubert van Es, immortalized the scene on April 29, 1975, hours before the city fell. A line of people clawed their way up a ladder, desperate to board—their last hope of escape. The van Es photo became symbolic of the entire evacuation. The Vietnam War was in the news daily, but early on, the innocence of childhood shielded me. I played with my G.I. Joes, dug foxholes, and engaged in mock battles. I must have been shot a thousand times. For a fourth grade school assembly celebrating Armed Forces Day, we were encouraged to bring something symbolic to honor those serving. My neighbor had been in the Special Forces in Vietnam. I didn’t really know where it was, and the meaning of war was not yet within my understanding. Yet I swelled with patriotic pride when he let me wear his green beret to school. That bonded me to the cause—the fight for freedom. When I entered junior high, men a few years older than my brother were dying in that far-away place. A youth advisor at church had recently returned from Vietnam. Preparing to pray for the soldiers still there, he played a recording of a battle he was in. Shouting and screaming were interrupted by rapid gunfire as bullets struck nearby. When the recording ended with a crack, he explained the tape recorder microphone had been hit. I got a little older that day. I knew if I was called, I would go. Mid-way through freshman year, the Paris Peace Accords were signed and we thought the war was over. Then the North Vietnamese violated the treaty, attacking after the U.S. withdrew. We didn’t go back. I felt we betrayed the trust of the South Vietnamese people. 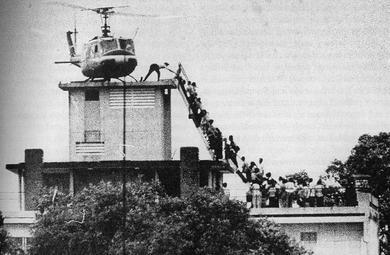 My junior year, as the communists breached Saigon, Operation Frequent Wind evacuated thousands. Because the airport was heavily bombed, helicopters took people from landing zones throughout the city out to ships. The Pittman Apartment building was one of those landing zones. It isn’t on any tourist map. TripAdvisor refuses to publish anything about it. We didn’t ask any locals where it was—they live under a communist regime. But I had researched and had an address. Pittman Apartments, Saigon, December 2017. Photo by Linda Street-Ely. Before me, the shabby nine-story structure was diminished by a skyline of modern glass-walled buildings. The roof-top looks like it does in the photo. The evacuation signal played in my mind—Bing Crosby’s “A White Christmas.” Here I stood, where mothers with babies had fled, soldiers with guns had aimed, and frightened families had fought their way to the building in hopes of escape. In the streets around me, South Vietnamese troops had abandoned their uniforms to protect themselves, as tanks rolled into the city. Pittman Apartment rooftop, Saigon, December 2017. Photo by Linda Street-Ely. This is the far-away place of my impressionable youth; the building in the photo, a piece of history that, though I lived on the other side of the world, was part of me. Mike: Nearly fifty years after the Vietnam War, mangrove and coconut palm trees still grow and the Mekong still provides for the hard working people. The next stop on our private tour is a coconut plantation. Balancing on the boat’s bow, I grab the ladder. A bamboo retaining wall extends from the water to a level landing above. During wet season, the ladder is unnecessary, but it’s dry and we have to climb. On top, our guide, Vi, explains process and purpose as workers bust open the outer husks and strip out the hard-shelled centers. “A strong worker can remove 2,000 coconut husks a day. They shred and spin it into twine to make garden mats. These coconut palm leaves will make roof thatch and brooms.” We walk through the plantation amid sweat and swinging arms. There will be no waste. Vi leads us down a mud trail. We tight-rope atop palm tree trunks over irrigation ditches to get to the plantation owners’ home. She wants us to meet the friendly, entrepreneurial family. The patriarch welcomes us from his hammock strung across the front porch of the traditional wooden house. Their plantation provides jobs and raw material for the broom factory we will tour. A motorcycle-rickshaw called a “tuk tuk,” takes us there. Linda: We step into the open concrete building, a roof for shade and only two walls, allowing ventilation from husk dust. Women sit on the floor, crafting up to two hundred brooms per day by hand. Their smiles are warm and genuine. They’re happy that people come to see how they make a living. If they work fast, they’ll earn two dollars a day. Though materially poor, they have pride. Some bring their children with them; we see babies on mats and school-aged children playing tag. The kids giggle when they hear foreigners talk. The brooms wholesale locally for fifty cents, retail thirty dollars in the States. Tour tips help the workers afford food. We’ll have more food than we can eat on this tour. Americans have a reputation, so the agenda includes a snack stop at Tám Nhu Garden. The 82-year old master gardener serves us a sumptuous variety of fruits on his gazebo—melons, bananas, and citrus. He loves his Jackfruit, the special treat of the region. We’ve never seen so vast and lush a garden. Not far from this botanical wonderland we step gingerly into a sampan. Our captain paddles the narrow boat through gentle currents in winding water under a canopy of coconut trees in a cinematic experience. When this quiet fork of the Mekong merges with the main river, we transfer to a power boat. We’re expected for lunch at an exclusive riverside restaurant. Under a thatched roof, on the patio on stilts, they bring dish after dish, at least ten courses. We want to be gracious. But we want them to take all these leftovers to the broom factory. We’ll take Võ Văn Kiệt Avenue back to Saigon. The avenue runs along the Tofu channel. Vi grins. Being vegan, we should like that name. But we’re full.